In CRM, Jeffrey Peel defines Customer Relationship Management in a radical new way by putting communications at the center. 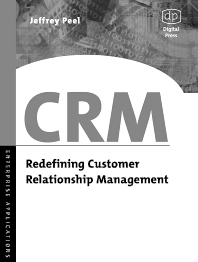 In the past, CRM was mostly about the technology, not about the customer. In this book, Peel talks about a new ethos that is beginning to fundamentally change the way organizations do business. At a technology level, CRM is increasingly about conjoined best-of-breed applications delivered via portal technologies. At a business level, it is beginning to invade traditional territories occupied by brand management or customer support. Peel shows companies how to make the shift to the new paradigm. Senior IT, Customer Service, Marketing and General Business Management, CFOs. Also technical specialists and business/IT students. Jeffrey Peel runs his own CRM and marketing consultancy practice, Quadriga Consulting, based in the UK. He has had a varied career in CRM, marketing research, and technology marketing. He was VP of Global Marketing for a European CRM software start-up (Amacis Ltd) and Head of Marketing Communications for a Division of 3Com Corp. He has also held senior IT research roles at Roper Starch in Princeton, NJ (now part of NOP) and Research International in London (part of marketing services giant WPP Group). Owner, CRM and marketing consultancy practice, Quadriga Consulting, based in the UK.